Public restrooms are breeding grounds for bacteria and sources for cross-contamination. As such, disinfecting these spaces should be a priority for building service contractors (BSCs) and housekeeping departments. But when it comes to using the correct disinfecting procedures, janitors often miss the mark. Some blame time constraints while others cite misconceptions about disinfection methods. Regardless of the cause, distributors can play an important role in educating and training customers to ensure that restrooms are properly disinfected. Todd Stefano, general manager of Henderson Chemical Co., in Macon, Ga., emphasizes that customers need to understand the importance of disinfecting restrooms on a regular basis to prevent the spread of illness. Distributors find that customers are often confused about what to disinfect in restrooms and how to go about it. Following are four of the most common restroom disinfection errors janitors make and how best to correct them. According to Mike Glass, president of M.D. Stetson Co. in Randolph, Mass., many custodians tend to mistakenly think that more is better. “At the end of the day, if you truly want to disinfect there’s no reason to disinfect surfaces that people don’t touch,” he says. Areas that fall into this category include toilet bowls and restroom floors. Instead, distributors advise customers to focus on high-touch surfaces, such as flush levers, faucets, and partition and entrance door handles. These items have the greatest potential for cross-contamination and spreading disease. Most disinfectants require a 10-minute dwell time. But too often custodians are in a hurry to get the job done and don’t follow manufacturers’ directions. Cleaning departments and BSCs often aren’t workloading their facilities properly. Not enough time or staff is allocated for the necessary procedures. When customers are pressed for time, Neff trains them to multi-task in order to ensure that surfaces stay wet for the required dwell time. 3. WRONG PRODUCT, WRONG APPLICATION. Regardless of new technologies and products, distributors still encounter customers who are stuck in the past. In addition, many custodians still apply disinfectant by spraying and wiping the surface — an ineffective technique that can also have a negative impact on people’s health and the environment. Stefano suggests that customers use dispensing systems, such as foam guns and pump-up sprayers, to take the guesswork out of mixing and applying disinfectant. If using a spray bottle, Glass recommends spraying disinfectant on a cloth rather than directly onto the surface. Some custodians also make the mistake of using the same tool to clean different surfaces, thereby increasing the chances of cross-contamination. “Janitors shouldn’t take a cleaning tool from one area to another, whether it’s a cloth, a towel or a mop,” says Glass. 4. NOT DISINFECTING OFTEN ENOUGH. The type of facility and amount of traffic in the restroom usually dictates how often that restroom is cleaned. Restrooms should be disinfected throughout the day, but distributors admit that, in general, restrooms are not being disinfected on a regular basis. However, even frequent disinfection is no guarantee of a germ-free restroom. But, the more janitors can disinfect — and do it properly — the less chance of cross-contamination for the public. Even when restrooms are properly disinfected, janitors’ efforts are wasted if people don’t wash their hands. Good hand-washing protocols are a must if restroom disinfection programs are to be successful. 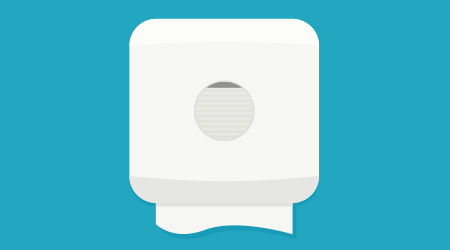 To encourage hand washing, janitors should ensure towel and soap dispensers are stocked. Signage can also help encourage users to wash their hands before leaving — and wash them for the recommended 15 seconds. Placing hand sanitizer dispensers near the exit can also be a final reminder for restroom visitors to clean their hands.